Feast, the new world-cuisine restaurant at the Starwood Sheraton, Bangalore, buffets diners with choice, literally beating them down with options. Plump prawns next to personalised pizzas. Chefs at live cooking stations putting prawns on your pizza. It's so new-wave it sometimes washes right over you. When the oven-baked to order, flatbread crust pizza arrives, the edge of hunger is gone because it took too long to get to the table. The grilled prawns got there early, they still smelled of the sea. The sushi, rolled deftly and presented prettily, tasted like it'd been out of the sea a tad too long. We must have arrived at lowtide, it took a while to get water refills. The salads, though, were fresher than our seafood. Crisp lettuce leaves, miniature bowls of jeweltoned vinaigrettes and creamy dressings; if Feast does reinvent, it should be a salad bar in its next avatar. Spanning the Southeast Asian, Western and Indian cuisine spectrum, everything we tasted stayed true to its origin. Feast steers clear of the one masala fits all pitfall, though some flavours could be punched up. When we spoke to executive chef, Gustavo Maurelli, we recognised some ordering missteps. He recommended the deep fried calamari rings, grilled salmon in miso reduction and grilled Mediterranean vegetarian antipasti, none of which had made it to our table. It brings us to our original grouse; too much choice. The space though, is spiffy. High ceilings, light colours and minimal dÃ©cor give Feast a sense of openness. The split-level layout makes navigation easy while holding a full plate. In that sense, Feast certainly does live up to its moniker, encouraging the allyou-can-eaters to go back for more. Feast has what it takes to make it memorable; authentic international flavours, an interesting if sprawling menu, and an ambience to complement. Until the food gets more direction, it's adrift in a sea of sleek, serviceable restaurants that will soon sail past the horizon. Address: 26/1 Dr Rajkumar Road, Malleshwaram Rajajinagar, Bangalore. Open-plan dining, a terrace, and bella Italian casa interiors; IT at The Grand even has food that keeps pace with its gorgeous space. After a long hiatus, The Grand, New Delhi is making its way back to our hearts through our stomachs. At the recently opened Italian restaurant, IT, chef Alfonso Lomonaco has put together an innovative menu which experiments with ingredients and adds a twist to Italian staples. Offering a unique twin taste concept, the menu infuses two or more distinct dishes, allowing diners to pack a range of flavours into a single meal. So you get to customise your dishes and sample more without stacking up your tab. In antipasti, we tried the seafood salad and the bruschette di polenta; while the spinach and seafood pairing went well with the tangy vinaigrette, the bruschetta, which uses corn in place of the usual wheat base would have done better in its traditional style. 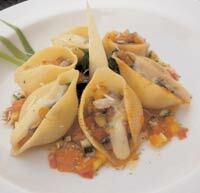 In mains, the large shell pasta stuffed with lobster is balanced on the palate with smoky lobster and mildly salted pasta, fired up by a spicy tomato sauce. The beetroot pizza is bold with its reddish-purple colour but tastes as robust as it looks. 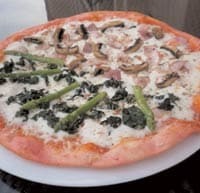 The pizzas were light and crisp and the chef's introduction of a spinach crust made an interesting change. The smoked salmon topping was a tad too salty, and far too pungent on the tongue when coupled with capers, but luckily our pizza came with four different toppings, so we just skipped to the next. For dessert, adventurous diners can experiment with the zabaglione al marsala, a rich whip of eggs and vanilla, but for the cautious, the tiramisu's a safe bet. Service was excellent, and the waitstaff was well versed with the menu and its variations. Though the dÃ©cor can be slightly gaudy in sections, the variety of spaces tones it down. Yes, it may be named after an article but IT is generally a hit. Address: The Grand Hotel, Nelson Mandela Road, Vasant Kunj, Delhi.